If you are a homeowner and your house is set up on a septic system, you may have been warned not to use a garbage disposal. While it’s true that older units or units that are not designed to be septic tank safe can cause sludge and overflow, InSinkErator has created a solution. For those individuals who want the convenience and benefits of a garbage disposal but fear the worst since they have a septic tank, meet the InSinkErator Evolution Septic Assist ¾ HP garbage disposal unit. ISE has been in business for nearly a century. In fact, they were the company that created and developed the very first food waste disposer, so they know a thing or two about garbage disposals. The extra grinding stages and the inject-able microorganism BioCharge liquid allows for the food waste particles to be pulverized and broken down so that they will be safe for a septic system. This model is a continuous feed type disposal which means you will not need to do large loads of food waste in batches like a batch feed model requires. Simply flip the switch to on and continue pushing the food waste into the mouth of the disposal until you are through. This saves time, effort, and money. Even if you enjoy doing home improvement projects, no one wants to need to replace a garbage disposal model every few years due to corrosion or bad mechanical design. InSinkErator aims to offset this need by designing the Evolution Septic Assist model with stainless steel grinding components which increase the durability and life span of the disposal unit. The ISE Evolution Septic Assist features a ¾ Horsepower Dura-Drive Induction, 1,725 RPM motor that makes quick work of hard and tough food waste like celery, potato peels, and even rib or chicken bones. It has two grind stages to ensure that the food waste gets pulverized into tiny particles which are then mixed with a natural microorganism that helps break down the food waste particles even further in order to make them safe for septic tanks. If you’ve owned an older style or budget brand garbage disposal, you are well aware that you could probably wake a whole neighborhood when you flip the switch on to dispose of some leftover chicken wing bones. 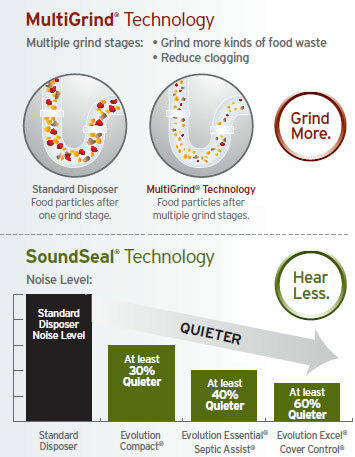 If you don’t want your disposal model to sound like a small plane is landing in your kitchen, you will enjoy the SoundLimiter insulation which reduces grinding noise by 40% over other standard models. InSinkErator is known for their SoundSeal technology which features an Anti-Vibration Mount®, Anti-Vibration Tailpipe Mount™, and a Quiet Collar® Sink Baffle which reduces the vibration noise that can move through cabinets and counter tops. Overall, the unit is much quieter than many other ¾ HP models currently available. This unit comes with a stainless steel quick-lock sink mount to ensure that installation is a breeze. It’s much like a “plug and go” model where you simply need to unhook your old model, then attach your new model with the same sink mount. This will allow you to save money since hiring a professional for installation is not necessary. The Evolution Septic Assist is 9.25″ W x 12.75″ H and weighs in at 25.5 pounds. Big enough to handle large batches of waste but small enough to fit comfortably in cabinet space. 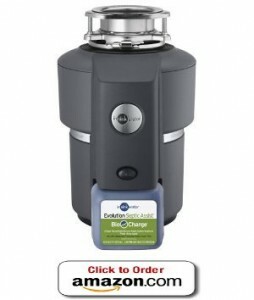 It has a grind chamber capacity of 40 ounces which is larger than other disposal models. Whether it’s a bag full of potato peels or a bunch of leftovers, the ISE Evolution Septic Assist will be able to make quick work of large quantities of food waste at one time. When it comes to garbage disposals, the InSinkErator Evolution series is top-of-the-line. The Septic Assist model is no exception. Featuring a powerful and efficient motor and a number of other cool features, this disposer unit packs a punch and will ensure you stay clog-free while making easy and quick work of food waste. Here is a look at the specs and features. The motor is powerful yet quiet, and the sound insulated grinding chamber ensures a quieter grinding process. You’ll be able to cut through pineapple rind, potato peels, rib bones and more with no trouble. You can typically clear the chamber within 15 quiet seconds. There is a 4 year in-home warranty, so should this product have a defect within four years of the purchase date, InSinkErator will come to you to fix or replace the product. This will help homeowners feel better about making such an investment, as a broken garbage disposal can lead to a world or problems. In the box, you will find the InSinkErator® Evolution Septic Assist® Food Waste Disposer, Quick Lock® Sink Mount, Quiet Collar® Sink Baffle, Jam-Buster™ Wrench, Anti-Vibration Tailpipe Mount™, Anti-Vibration Mount®, Stainless Steel Sink Stopper, Spring Type Hose Clamp, and the installation instructions. By far, the most exciting feature about this product is the ability to be used in conjunction with a septic system. Most of the time, garbage disposals are discouraged from being used when a home is set up on a septic system, but with the use of the inject-able microorganisms that break down the food waste particles, this model works like a charm. You’ll still have all the convenience and green living benefits of a food waste disposer unit, septic system or not. Another great feature of the Evolution Septic Assist is its easy installation process. Most people did the installation themselves with little to no problems, and typically under an hour. The installation instructions that are included are straight forward and replacing an old unit will be a breeze. The quiet motor and SoundSeal technology has been a real treat for owners. Some say it’s so quiet that you can’t even tell if it’s running or not. That is truly a plus for households that contain little ones who like to sleep a lot. It was hard to find anything wrong with this product. 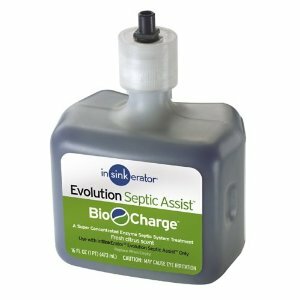 The biggest annoyance you may find with this product is the need to refill for the BioCharge Injection liquid which helps with the breakdown of food waste particles making them safe for the septic tank. You will typically have to purchase a new bottle 3 to 4 times a year depending on how many times you use your garbage disposal a week. 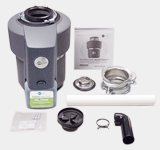 Customers seem to love the ISE Evolution Septic Assist ¾ HP garbage disposal. They have rated it with nearly perfect scores. An amazing 93% of customers rated this unit at an astounding 5 out of 5 stars, while the rest scored it 4 out of 5 stars. There was hardly a bad thing to say about the InSinkErator Evolution Septic Assist with most people commenting on how well it worked at keeping their septic system in good working order without needing to be emptied an exorbitant amount of times. InSinkErator’s Evolution series are high-end disposer products that tend to be priced a bit higher than other models in the same class. With the price tag comes the assurance that you are getting a quality and innovative product that will effectively and efficiently work beyond what you could expect. Not many companies make a model that is safe for septic systems which is also a reason this particular product dominates the market. Amazon always seems to have the lowest price for this model, as I’ve researched a lot on this particular unit.